Oil industries – Emissions from oil & gas production and mining increased by 39% from 1990 to 2013. Much of this is due to expansion of the tar sands. Transportation – Emissions increased by 49.6%. Much of this was due to a shift to and increased use of SUVs and vans, as well as more use of semi-trailer trucks to move goods. Electricity and heat generation – Emissions increased by 8%. Emissions in this sector peaked in 2004 and have been in a general decline. However, emissions have crept up again in 2012 and 2013. In 2013, emissions from the fossil fuel industry represented 27% of Canada’s total emissions. Figure 1 shows that this was a 35.8% increase from 1990. Petroleum refining industries’ emissions grew by 128% in this period. 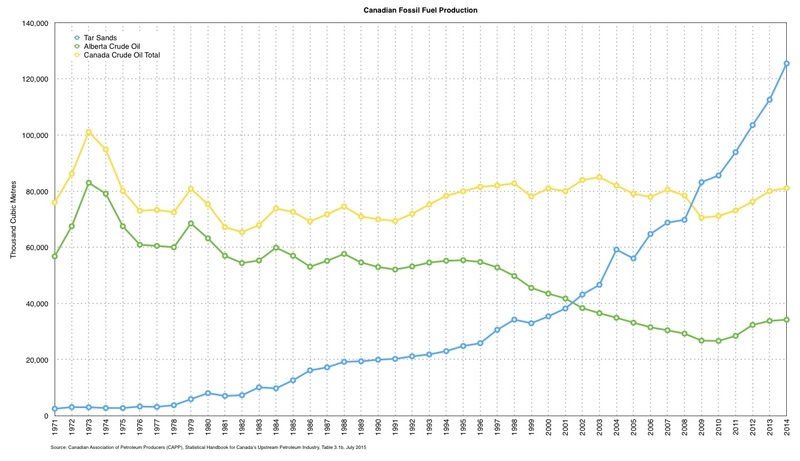 Figure 2 shows that bitumen and synthetic oil production from the tar sands increased more than 6 fold (629%) from 1990 to 2013. 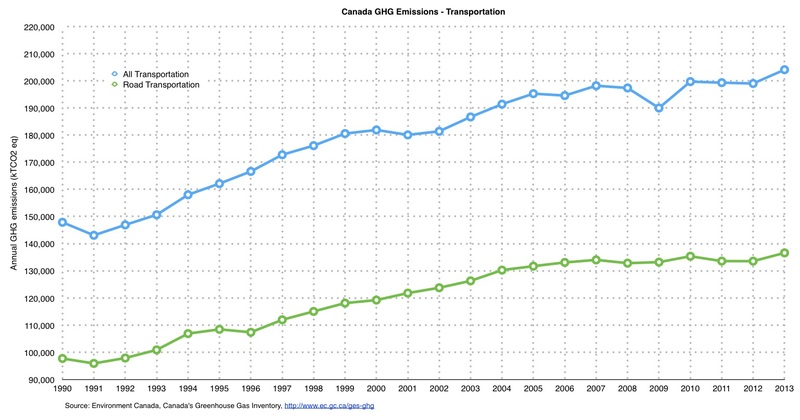 Figure 3 shows the trend in Canada’s GHG emissions from transportation. Transport accounted for 28% of Canada’s emissions in 2013. From 1990 to 2013, these emissions grew by 40%. Since 1990, there has been a significant shift in the vehicle types used for passenger transport: emissions from light-duty gasoline trucks (SUVs, pickups, vans) has risen by 108%, whereas emissions from cars decreased by 14%. Figure 4 looks at emissions from SUVs, cars, and semi-trailer trucks. Figure 4 also shows that from 1990 to 2013, there was a 112% rise in emissions from heavy-duty diesel transport. During this period there has been a rising freight intensity of the economy. In other words, more freight transport per unit of gross domestic product (GDP). This comes about from rising trade within and between provinces and increasing international trade. Since 1990, there has been a significant rise in the use of heavy-duty trucks for freight transport relative to rail, marine, and air. Moving freight by truck is one of the most emission-intensive ways of moving goods. 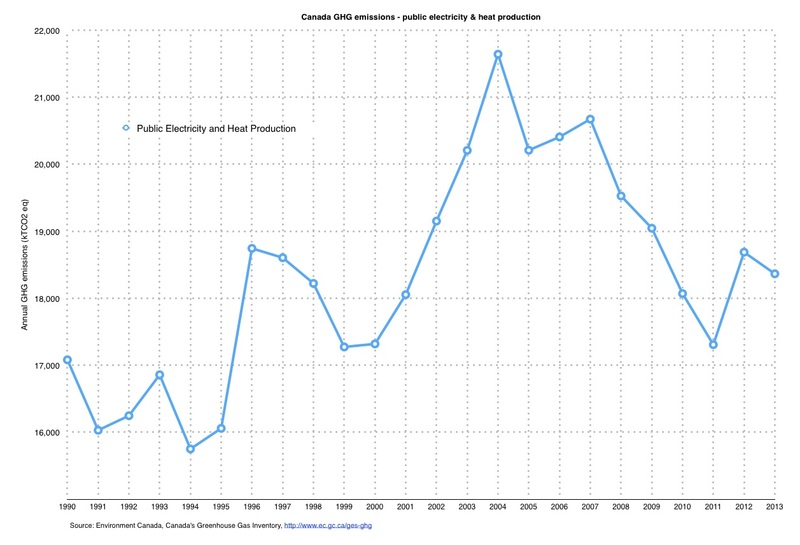 Figure 5 shows GHG emissions due to public electricity and heat production from 1990 to 2013. 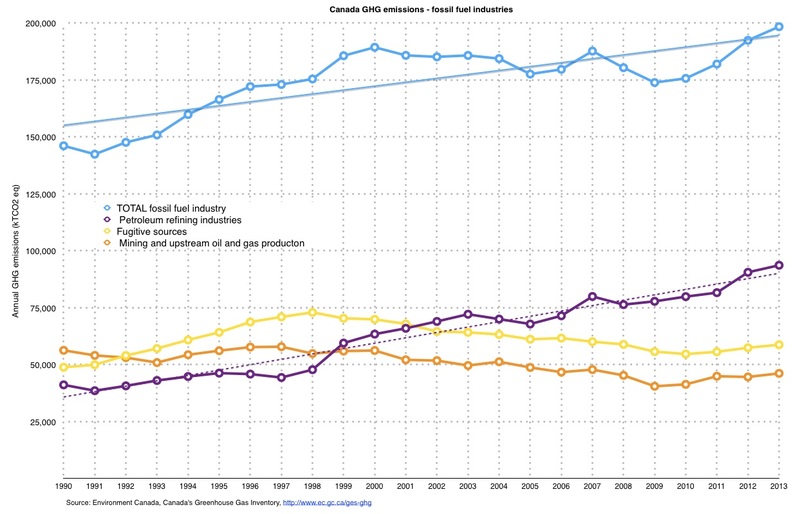 After a peak in 2004, there has been a general decline in Canada’s total emissions from this sector. Ontario has been responsible for much of this reduction. A key reason that Manitoba’s GHG emissions are comparatively low is primarily because virtually all of our electricity comes for hydroelectric generation. Figure 6 shows how the mix of electrical generation changed across the country between 1990 and 2011. 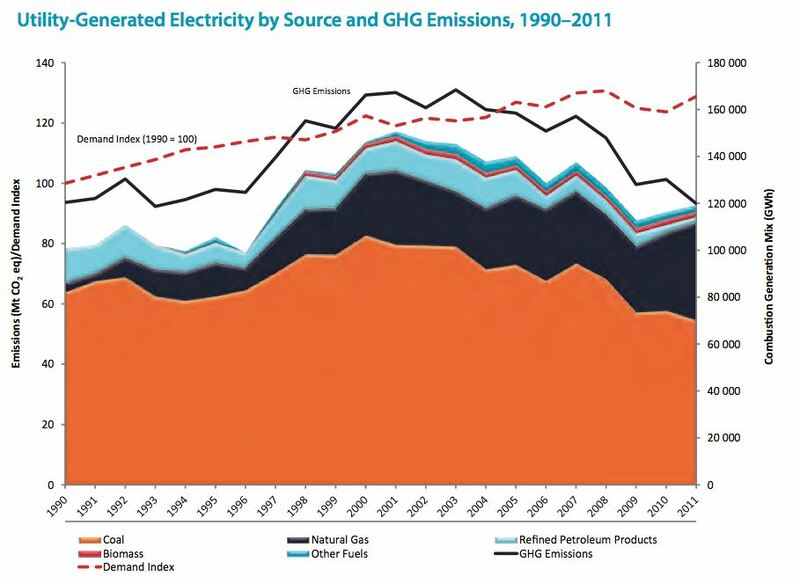 GHG emissions from electricity generation grew by 37% during this period. Emissions peaked in 2003. They then decreased by 29% over the next eight years. Much of this decrease has been due to a shift away from coal and oil as a source of energy to heat the electrical generating boilers and turbines. The replacement has been natural gas. Natural gas produces less GHG per unit of power than do coal or oil. Some of the decrease after 2002 was due to the return to service of a number of nuclear plants. This was part of Ontario’s commitment to reduced coal-fired electricity generation. 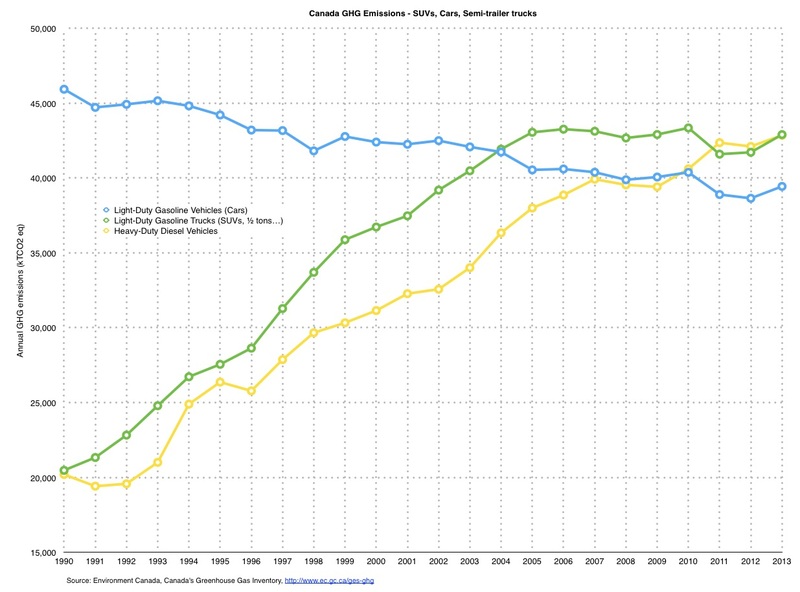 The amount of electicity generated in 2011 was 31% higher than in 1990. However, this did not result in a corresponding increase in emissions due to GHG reductions through fuel shifting and increases in efficiency.